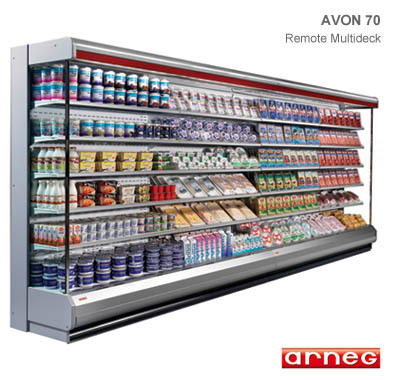 The Arneg AVON 70 Remote Multi-deck Refrigerated Cabinet provides an ideal solution for retailers with limited floor space to boost visibility of display stock. Trade Cooling Ltd of Telford distribute Arneg products in the UK. Ideal for the retailer with limited space or requiring a cost effective answer for the display of drinks / dairy products. The Avon 70 is only 717mm in depth yet gives a high volume of merchandising space, boasting 5 x 400mm deep adjustable shelves.